For the month of June, I have been teaching kids how to cook. Sadly, it is the last week of cooking classes. These kids have been so fun and so curious! And really, such great cooks! I let the older kids decide what they wanted to make for the last week of class. One of the things they really wanted to learn was soft pretzels. I have only made these one other time and while they are pretty simple to make, they were not a regular in my household. So, I set out to find a good recipe for these students. Nailed it! Try these soft, chewy, touch of sweet, like you find in the mall pretzels! Warm the milk in the microwave for about 40 seconds. Pour into a medium bowl and sprinkle in the yeast. Let the yeast soften, about 2 minutes. Then stir in the brown sugar and 1 cup of the flour with a wooden spoon. Melt 2 tablespoons of the butter and stir into the mix. Add the remaining 1 ¼ cups flour and salt to make a sticky dough. Add more flour if necessary (you’ll probably need a few tablespoons) to form dough into a ball. Turn dough out onto a lightly floured surface and knead, adding more flour if needed, until smooth but still slightly tacky, about 5 minutes. Shape into a ball, place in a clean, lightly greased bowl and cover with plastic wrap. Let rise in a warm spot until doubled in size, about 1 hour. Preheat the oven to 450 degrees. Line a large baking sheet with parchment paper and spray with nonstick cooking spray. Punch the dough to deflate it, then turn out onto a lightly floured surface. Divide the dough into 6 equal pieces. Roll and stretch each piece with the palms of your hands into a 30-inch rope, holding the ends and slapping the middle of the rope on the counter as you stretch. Form each into a pretzel shape (form a U-shape, then holding the ends of the rope, cross them over each other and press firmly onto the bottom of the pretzel). Dissolve the baking soda in 3 cups warm water in a shallow baking dish. Gently dip each pretzel in the soda solution, then arrange on a prepared baking sheet (re-shaping if necessary) and sprinkle lightly with course salt. Bake until golden, 10 – 12 minutes. Melt remaining 3 tablespoons butter and brush on baked pretzels. 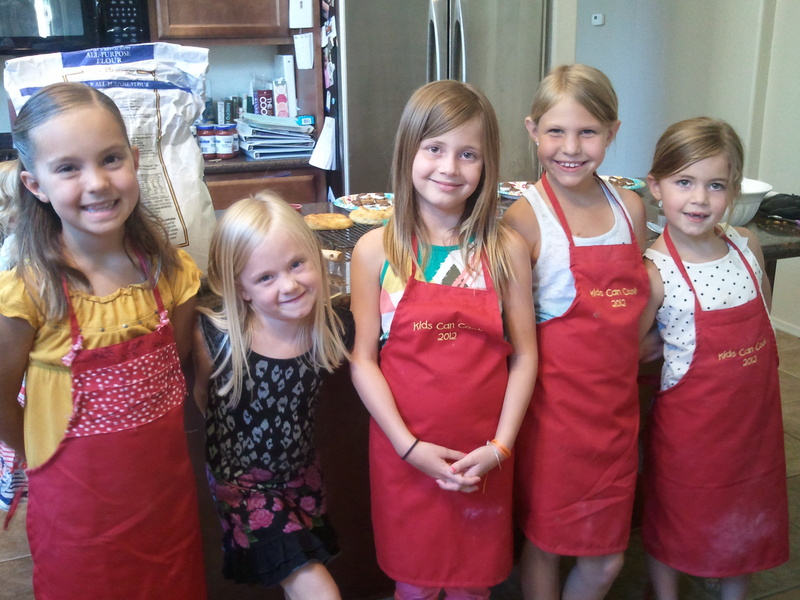 Cooking Kids Class, minus Zoe. Aren’t they cute?!? Thank you LucyJane. Just made these with my son. Auntie Annie need not fear me, but they did turn out pretty darn good, for a first try. Not as pretty as what you can buy at the mall, but they taste even better. 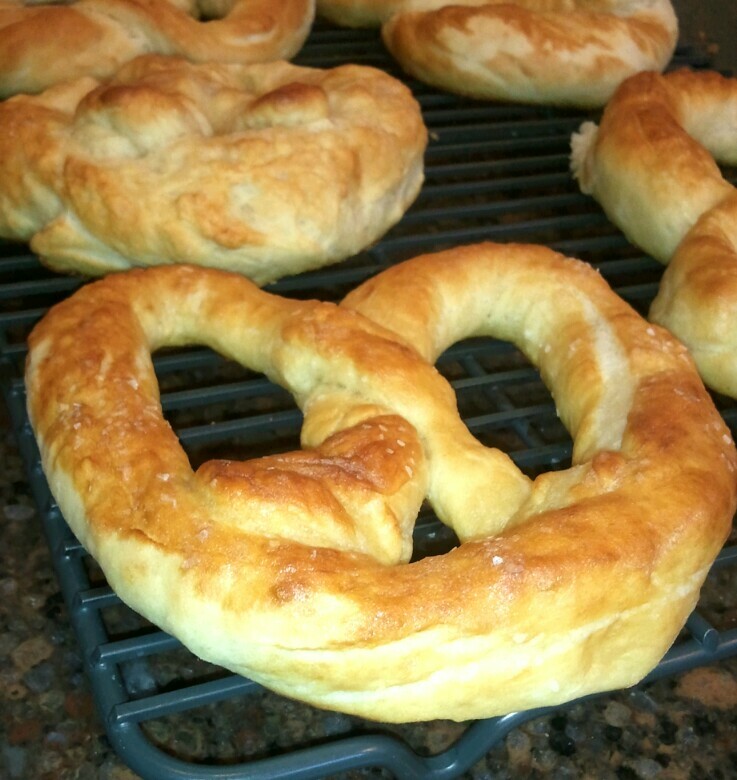 Im sure throughout the summer we will master the pretzel twist…then watch out.